T3 Agenda: Watch G-Shock test its Gravitymaster...in space. UBTECH's Stormtrooper, Ryobi's cordless, brushless chainsaw. And more! In today's Tuesday edition of the T3 Agenda - Watch G-Shock put its Gravitymaster watch through the ultimate test... the vacuum of space. Ryobi's new cordless, brushless chainsaw. And more! 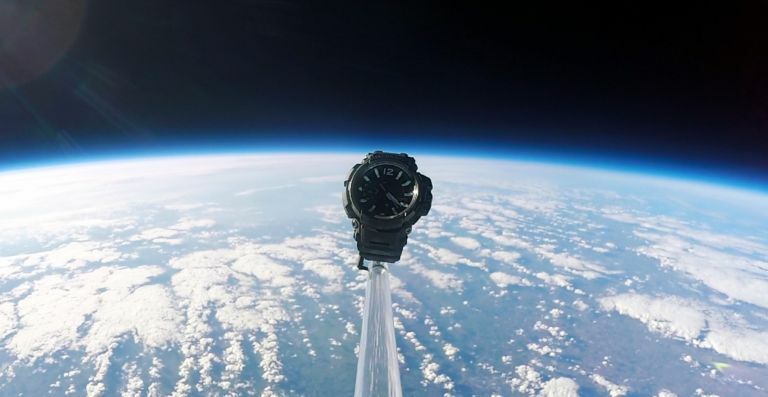 To mark the release of its new Gravitymaster watch, G-Shock has decided to put its super-strong new timepiece through its paces in the most extreme test of all... the cold vacuum of space. The watch survived temperatures of minus 58 degrees Celsius, rising to a height of 44.1km above the Earth. It was then sent on a 25km surge past the ‘Armstrong Limit’, the outer limit of human survival before blood begins to boil, spending a total of 1 hour and 22 minutes in space. For more info on the new Gravitymaster range, and the rest of Casio's G-Shock collection, head on over to its online store today. First and Third Person AR (Augmented Reality) App Modes: Protect the First Order against the Resistance in your own room, issuing direct verbal orders, and launch attacks via the app interface in first and third person views. Voice Commands: Speak directly to your Stormtrooper to interact in new ways. Facial Recognition: Create a database of up to three faces. Note that the Stormtrooper Robot does not connect to the internet and stays within a closed network. Sentry Patrolling: Order your Stormtrooper to patrol the designated area to detect and respond to intruders. The Star Wars First Order Stormtrooper Robot by UBTECH retails for £299.95 and is available for pre-order at starwars.ubtrobot.com, Amazon, Argos, Dixons, Very, Toys R Usand Menkind. The leading smart home provider LightwaveRF has just launched a brand new range of products that are compatible with Apple HomeKit. The new certified Generation 2 range will consist of a new Smart Link Plus, Smart Dimmers, Sockets and heating accessories. This partnership means users will be able to control their LightwaveRF devices with IOS apps and Siri voice commands. The new Lightwave range has been part of a two-year research and dev program with new features including a built-in energy monitoring, colour changing LEDs to indicate status and wire-free two-way switching. Ryobi’s has just launched its latest woodcutting wonder, 18V ONE+ Cordless Brushless Chainsaw. This new model has been designed with high performance brush-free tech for increased runtime, providing the ultimate cutting experience. With a mechanical chain brake, automatic oiling system and full wrap around handle, not only is this battery-operated chainsaw a safer and more comfortable alternative to some traditional petrol models, it’s incredibly easy to use. Its 30cm Oregon Bar and Chain and 10m/s chain speed ensures smooth operation when it comes to chopping small trees, branches and logs. The Ryobi 18V ONE+ Cordless Brushless Chainsaw is priced at £149.99 (for the tool only, battery and charger are sold separately). IKEA's great Place app - which uses augmented reality to visualise and share how different products will look within a space, such as a home, office, school or studio before buying – has now gone live on iOS devices. Built on Apple’s new ARKit technology and available on iOS 11, IKEA Place lets you virtually “place” furnishings in your space. From sofas and armchairs, to coffee tables, all of the products in IKEA PLACE are 3-D and true-to-scale so you can make sure it’s the right size, design and functionality for your room. Head on over to the App Store to download it today. OVO and Nissan have announced a new collaboration to accelerate the adoption of home battery storage in the UK, with the intention of launching a V2G (vehicle-to-grid) offering. The new setup is the first of its kind in the UK and features VNet - OVO’s very own intelligent energy technology - with the capabilities of the Nissan xStorage Home system. OVO plans to launch OVO SolarStore (in its beta form), the company’s first battery storage offering for customers. In the near future customers will be able to purchase Nissan’s xStorage Home system direct from OVO, and benefit from a £250 annual credit and estimated average £240 savings on their energy bill.